With the holidays coming up, there are some great gadgets that you may want on your wishlist this year. From drones to smart speakers, there is a great gift out there for you or a family member. The first item that is popular this holiday season is the new DJI Spark. This drone is a small one and can be controlled from your phone or your hand, which is a super cool way to get some sweet overhead pictures. If you love to take cool videos you may want to have this on your holiday wishlist. The next item that is a fun gift idea for yourself or a friend this holiday season is the brand new GoPro Fusion. This GoPro is not just your regular action camera; it has two cameras capable of taking 360 degree videos, allowing you capture every angle unlike a normal GoPro. Don’t worry about not capturing that awesome clip; it will record all around. 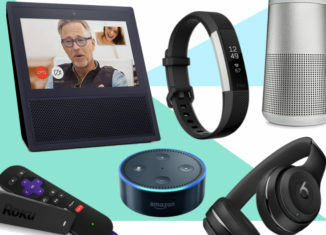 The next gift that you may want on your holiday list is the new line of Amazon Echo products, as well as the new line of Google Home smart speakers. All of these products are capable of responding to your voice as well as controlling your smart home products. Just by saying “Alexa” or “Ok Google,” you can have these virtual assistants answer your questions, set a timer, and much more. Speaking of smart home products, the Philips Hue lightbulbs let you change the color of your room right from your phone and are also compatible with Amazon Alexa or Google Home. These light bulbs are not any ordinary bulbs. They can change to any color in the rainbow and can also be used to make a cool party effect with the included app. From the brand new cameras like the GoPro Fusion to smart speakers, there is definitely a cool, unique item to add to your holiday list this season.